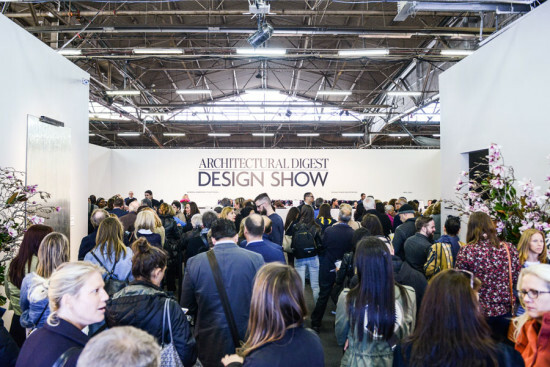 This year's Architectural Digest Design Show at Piers 92/94 was full of big-name brands with exciting tech innovations. However, a lot of the most exciting designs came from the AD Design Show's MADE section which featured juried galleries of more than 150 artists and designers from around the world. León León's Acapulco chair isn't just stylish, it also happens to be made of Pineapple leather (yes, the fruit). The designers are the first brand in the world to utilize the fabric in a useable product. This hyperrealistic wallpaper from Flavor Paper comes in four mesmerizing color options. Each can make any office or home space feel balmy and tropical even in the dead of winter. Nobel Truong makes neon acrylic cacti sculptures and lamps that are wired with UV blacklight LEDs. They're perfect for those of us not gifted with a green thumb (even when it comes to succulents). Banner's Haven ergonomic chair is sculpted out of solid ash. They're available in black or white with leather or exotic calf hair upholstered seats. Sarkos wallpaper is entirely hand-painted and each panel is one-of-a-kind. The paint creates dazzling textures with shades that change depending on light. Everything at the Sony Life Space UX booth was exciting, from an incredibly high-definition Short throw projector to the portable version (seen above) that can be project on a wall, ceiling, or table. It can even fake a gorgeous view in a windowless room. There was also a stunning glass sound speaker that offers 360 degree non-directional clear sound. The most affordable product was a LED bulb speaker that can add music—and a warm glow—to any room. Miele's Generation 6000 dishwasher, in addition to being supremely quiet and efficient, can now be installed completely flush to the all—instead of a handle, just knock twice to open. Jennair offers fully integrated and wall-flush designs that come in a variety of options. One of their new features is an obsidian black interior that really makes food visually pop. Margaret Russell, the editor-in-chief and vice president for brand content at Elle Decor, has been named editor-in-chief of Condé Nast's Architectural Digest. She will succeed Paige Rense who has edited Digest for nearly 40 years. Russell has made Elle Decor a credible rival for Digest, and is respected for her taste and discerning eye. Digest remained virtually unchanged for much of Rense's long tenure there, so many expect Russell will update the magazine's image as well as bring new architects and designers into its pages. The magazine's offices will relocate from Los Angeles to New York. Russell will take over in September. HAPPY B-DAY, MR. ARCHITECT On October 12, Richard Meier turned 75. His birthday bash for 150 was held that night at the Four Seasons, or rather under a white tent on Park Avenue alongside the Seagram Building fountains. Eavesdrop didn’t find anyone on the B-List who was invited, but all the A’s were there including Peter Eisenman, Michael Graves, David Rockwell, Robert A.M. Stern, City Planning Commission chair Amanda Burden with TV talker Charlie Rose, and President of the American Academy in Rome Adele Chatfield-Taylor with playwright John Guare. A Meier follower tells us that his 50th was held at his duplex on East 72nd Street, where he raised eyebrows by exiling his mother to a far corner of the room, while putting Burden on his right. Interior designer Rose Tarlow hosted his 60th birthday on the tennis court of the house he designed for Norman and Lisette Ackerberg in Malibu. This time, he was sent into his fourth quarter of a century by daughter Ana, who arranged everything in no-surprise white. No roasts among the toasts made by family and friends, with Meier himself going only slightly off-color in his effusive compliments to his lovely offspring. The cake was a layered white slab. ET TU, GUY? Buried but not deep enough for our eagle eyes is this passage in the October issue of literary journal The Believer, from an engaging interview with Guy Nordenson: “Frank Gehry’s relationship to engineering and construction says: the cruder the better. You visit the Disney Concert Hall and, in the office of the musical director, there’s this gigantic gusset plate that’s part of one of the trusses in the system. It’s exposed and fire-protected. One of the architects who worked on the project described it to me as a train crash in a room. It’s monumentally messy.” TURNING THE PAIGE It’s that time of the month again when bets are placed in showrooms across the nation. What is the future of Paige Rense and, for that matter, Architectural Digest? Authoritative rumor has it that AD’s eons-long editrix has been told she’s out at the end of the year. One shelter magazine editor-in-chief reports having been interviewed and insists that Condé Nast is going through the usual suspects one by one. We’re guessing that’s Deborah Needleman, editor-in-chief of defunct Domino; Stephen Drucker of House Beautiful; and Margaret Russell, the editor-in-chief of Elle Décor. But La Rense is not likely to shuffle off quietly. According to a prominent designer, she recently arranged a skit to impress bosses Si Newhouse and Chuck Townsend. Honorees on her coveted AD 100 list gave testimony to a group of advertisers that AD is still the number one shelter magazine in the world and that, hard times notwithstanding, they should continue to buy pages. Take away? Paige is essential to Si’s ongoing health and wealth. Another source says that Si only makes major personnel changes twice a year—right after Labor Day and right after New Year’s. Look for the other Louboutin to drop around January 2, 2010. Send engineering tips and ad pages shart@archpaper.com. A version of this article appeared in AN 17_10.21.2009.